In 1909, the school board began looking for a suitable location for a school building. By July 24, 1909, 2 free public school brick buildings were planned. June 1910, Mr. Eudress of Austin had completed plans of both proposed school buildings and the school board accepted the plans. 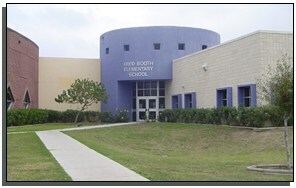 1st Ward School, built in 1910, was renamed The Fred Booth Ward School on March 9, 1931, in honor of Fred Booth, a local business man, former school board member and owner of Mont Meta Memorial Park who had died the previous year. Teachers in those early days of 1909 earned $60/month and the principal was paid $80. The enrollment by 1925 was close to 700 students (500 more than the high school) with 14 teachers. A large addition was made in 1922, a four room addition was made in 1928, the auditorium was built in 1930, other additions were built in 1942 and 1945, all of which have since been razed. In January 1915, the outhouses were remodeled. In July of 1928, toilets were added with the completion of the new addition. On September 30, 1946, the auditorium roof collapsed, but no one was hurt. The same night the local chapter of the Red Cross executive board met to make plans for handling possible outbreaks of the disease. Makeshift hospitals were set up. Dr. Morris and Dr. Cash were the doctors in attendance. Workers enclosed the new open railroad platform to use as a temporary hospital. The other hospital was at Fred Booth School. On November 13, 1918, the quarantine was lifted and services of Thanksgiving were held at all the churches. Schools and other public buildings were reopened and life continued. During the hurricanes, Fred Booth was used as a shelter and after the 1933 storm, women of the community gathered on weekends to make pillows and mattresses. During the depression, can and dry goods would be issued for the needs under the shade of the arcades. Some of the principals that have served at Fred Booth School are E.E. Shirar, Fenton Caldwell, Dorothy Norris, T.A. Smith, H.L. Townes, Miss Youker, Frank Pierce, Ennis Hall Gilbert, Miller Jordan, Raymond Howard, Dale Peek, Roy Cano, Robert Allen, Zora Cope, Chrissie Bucklin, Gloria Rocha, Beatriz Rodriguez, Cecilia Rangel, Manuel Cruz, and currently Mary Alice Leal.